Dubbed by Sprudge as ‘the Iron Man of all coffee competitions’, Coffee Masters is a fast-paced multi-disciplinary barista competition that launched at The London Coffee Festival in 2015. 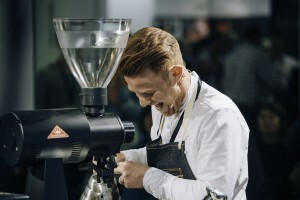 The competition takes place twice a year and sees some of the world’s best baristas compete head-to-head in a series of disciplines for the prestigious Coffee Master title and a £5,000 prize. The next Coffee Masters event will take place at The London Coffee Festival from 28-31 March 2019 at The Old Truman Brewery, London. Coffee Masters will also return to The New York Coffee Festival from 11-13 October 2019 at the Metropolitan Pavilion, New York. Working across coffee, food, fashion, design and lifestyle, Allegra Events produce immersive events that engage, inspire and thrill audiences across the world. We thrive at creating credible (and edible) content that is sound and delivers across multiple platforms.